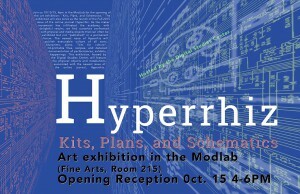 Join us October 15, 4pm-6pm in the ModLab (Fine Arts, Room 215) for the opening of an art exhibition entitled “Kits, Plans, and Schematics.” The exhibition will also serve as the launch of the Fall 2015 issue of the online journal Hyperrhiz. As the maker movement has infiltrated the academy, with delightful results, we find ourselves confronted with physical and media objects that can often be exhibited but not “published” in a permanent forum. The newest issue of Hyperrhiz will publish executable culture of all sorts: blueprints, plans, “kits for culture,” 3d-printable files, recipes, and detailed documentation of performances, exhibits, happenings. This exhibition hosted by the Digital Studies Center will feature the physical objects and installations associated with this issue of Hyperrhiz. Wine and Cheese will be served.